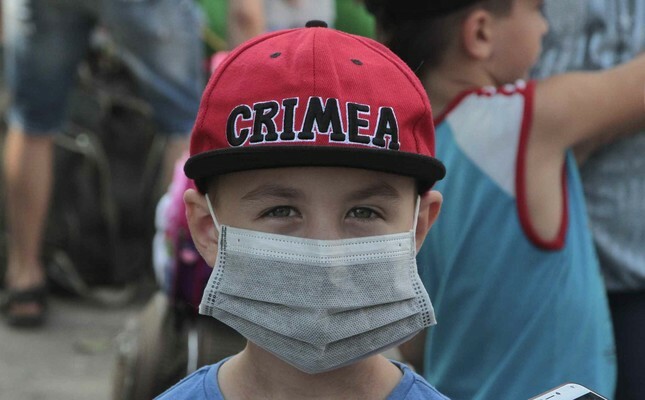 Thousands of children have been evacuated after air pollution levels reached a critical level near the Ukraine-Crimea border, leaving many children struggling to breathe. The pollution crisis that has left many metal items like swings in the park to rust and fields to turn black has ecologists and doctors blaming the abundance of industrial pollution in the air. People have been struggling with the crisis and complaining about shortness of breath, allergies and stomach ailments since August, which led to the evacuation of nearly 4,000 children, some 3,000 from the Russian-controlled side and 700 from the Ukraine-controlled side. A small city with a population of 22,000 on the Russian-controlled side, Armyansk, declared a state of emergency on Friday due to a strong stench of sulfur. "It was unnatural… There were few people in the town. The leaves had fallen off the trees, though it was early fall, and the grass in the fields was black," he said. Russian authorities point to the acidified pond of sulfur formed over a decade at a Crimean chemical factory as the source of the crisis, while Ukrainians deem the operations at the factory to be the culprit. After Russia annexed Crimea in 2014 — a move regarded as illegal by the international community — Ukraine cut the supply of a water canal which fed the pond during summertime, causing the pond to dry up and accumulate a high concentration of acid residue. The residue, which is believed to be the main culprit, caused residents on both sides of the border to experience symptoms like coughing and burning sensations in the throat and nose. Last week, Kremlin-installed de facto authorities closed down the factory but the reservoir contaminated with acidic sulfur still remains nearby. According to the World Health Organization, air pollution takes approximately 7 million lives per year, a number that could grow in coming decades unless the energy sector steps up its efforts to slash emissions and invest in clean alternatives.